Corporate & Client Gifts? You got it! Looking to boost employee morale, grow client relationships, and drive customer sales? Pop-N-Cream is here to help! Whether you’re congratulating an employee or thanking a client, our popcorn makes the best gifts! Choose from an assortment of tin and gift box options. Customize each tin by adding your company logo! 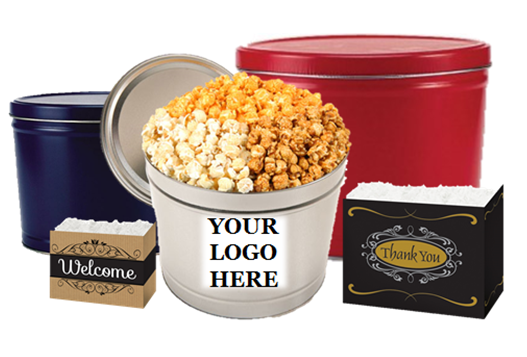 Click on our "Shop" drop down menu and click either "Popcorn Tins" or "Gift Boxes" to uncover your next corporate gift! Corporate Events? We cover that as well. Our gourmet popcorn bags are the perfect party favors. Because we have over 70 flavors, including candy colored, our popcorn will compliment any color scheme you have in mind! We also can set-up at your event and supply your guests with our popcorn as well. For more information, please email Pop-N-Cream at info@popncream.com.